Spread baguette slices with softened butter. 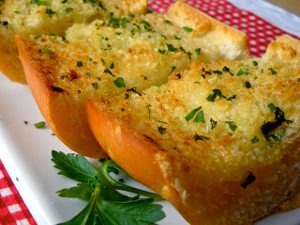 Sprinkle with a pinch of garlic and onion granules. Shake a nice amount of Mac Yourself™ cheddar cheese powder, a little paprika on the top. Place under broiler until golden brown (be watchful, they brown quickly).